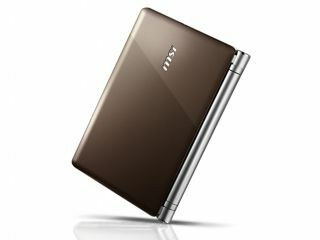 MSI has launched the U160 netbook, with an Intel Atom N450 processor, one inch frame and gold finish. The U160 has a UK release date of March and will be priced at £329, and has already picked up a plaudit by winning its category at the 2010 IF design awards. "Packed into an extremely slim 1-inch frame and weighing just 1kg, the U160 punches way above its weight as its Intel Atom N450 processor affords low consumption, low heat generation and ultra-economomical power usage while offering above 9 hours of extended battery life," says MSI. "Proving it's worth in the design stakes, the U160's typically slim and attractive Gold chassis, combines comfort, style and functionality by featuring a 10.1 screen MSI's distinctive Chiclet Keyboard, Colour Film Print Technology, an artistic and ultra-thin fuselage, and all new software upgrades. "Finished in a dazzling gold colour film print coating the stylish U160 embodies MSI's flawless and exquisite craftsmanship following the phenomenal success of the impressive U series."